Welcome! This is a Secure Socket Layer Site. 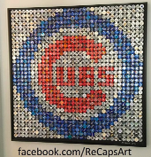 BDSI found Mike through our continuing search to locate artists that like to work with bottle caps. It turns out that Mike was only about an hour and a half away from us, so he was able to drive over and spend some time with us at our plant in Smithfield North Carolina. Mike is outgoing and full of energy, and it was great that he shared his talent with our staff. Mike brought a big car and took home a lot of caps. 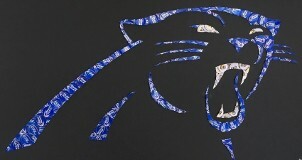 We hope that he will have continued success with his art projects! 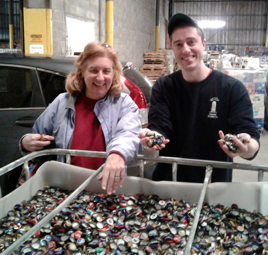 Mike Valle looking through caps at BDSI with Mary Jo Buzard! News Story about Mike Valle! Since 2009 Mike has created about 30 portraits and custom orders, refining his process, and slowly finding ways to make them quicker as well as reducing the weight. So far Mike has focused portraits. They are primarily of iconic photos of musicians, actors, and artists whom he likes, Mike’s custom orders are sports or company logos.